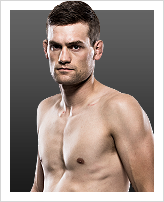 Thoughts on opponent, Alex Enlund? Enlund is a solid grappler. I’m not too impressed about his level of competition so far, though. TRAINING: At the moment, I’m alternating between boxing, wrestling and jiu-jitsu at night. Twice a week we spar hard. Strength and conditioning in the morning rounds out my fight camps. When and why did you start training for fighting? I have a twin brother and a big brother who is two years older than me. The three of us had too much energy growing up and we were watching a lot of Batman and Ninja Turtles as kids, so it was a no-brainer that we’d eventually end up taking martial arts classes. What does it mean for you to fight in the UFC? I have reached the destination of a long journey. What was your job before you started fighting? I’m an instructor at a company that sells precision turned parts.